Travelers touring Geneva, Switzerland, may pause to consult their guidebooks and admire majestic views of the Alps and Jura mountains surrounding the city without the slightest notion that some 400 feet below them two streams of subatomic particles are hurling at unfathomable speed toward a cataclysmic collision. Geneva is home to CERN, the European Organization for Nuclear Research, an international collaboration among 21 member states and over 500 academic institutions and corporations. CERN operates the Large Hadron Collider (LHC), the world’s largest scientific instrument and its most powerful nuclear accelerator. It was the LHC that produced the first evidence of the long-sought-after Higgs boson in 2012. The LHC consists of four circular tunnels of increasing size, the largest of which is well over 16 miles around. It is within this large ring that subatomic particles—usually protons—are propelled in opposite directions to more than 99.9 percent the speed of light before superconducting magnets steer them onto a single path. The resulting collision produces a dizzyingly complex spray of fragmented particles. Data on the particles’ charge, spin direction and other attributes—millions of gigabytes of it per year—is recorded by massive yet highly sensitive detectors such as the Compact Muon Solenoid (CMS), which weighs over 14,000 tons. 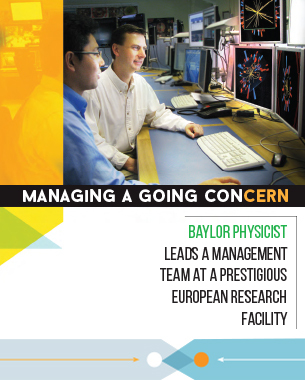 Two Baylor physicists, Dr. Jay Dittmann and Dr. Kenichi Hatakeyama, have been working with the CMS collaboration at CERN since 2010. Both Dittmann and Hatakeyama are associate professors of physics in Baylor’s College of Arts & Sciences. In his new role, Dittmann will oversee the HCAL’s Data Performance Group (DPG), one of three subgroups assigned to manage various aspects of the HCAL’s operation. The DPG is the subgroup concerned with calibrating and validating data, as well as with designing the comput er algorithms used to render the data into plots, histograms and other forms for analysis. While CERN’s Large Hadron Collider generates huge volumes of data that relate to many topics in elementary particle physics, Dittmann says he is primarily focused on one of the most enigmatic concepts in the cosmos—dark matter. “There are several models that could explain what dark matter is. Right now supersymmetry is one of the best candidates we have for describing particles and forces in our universe. The standard model has done a very good job of explaining the universe for decades, but supersymmetry is a kind of superset of the standard model that could help solve some other mysteries,” he said. Since this story was initially published, Hatakeyama has assumed leadership of the Data Performance Group. The DPG is the largest of the three subgroups assigned to manage the Hadron Calorimeter’s operation, and it consists of hundreds of scientists who develop software that analyzes the electronic signals from the HCAL. "We perform a very careful calibration of hadron energy measurements by continuously monitoring the new data that we collect," Hatakeyama explains. "We have to continuously apply corrections to the data to account for changes in the detector conditions." Dittmann, who previously led the DPG, continues to serve as deputy project manager of the team that manages the HCAL, a role in which he provides leadership to more than 500 physicists, engineers, technicians and students from 60 universities and scientific institutions around the world.